There was a public hearing on SGI's permit to mine Pine Hill (aka "the Northern Tract") on July 23, 2018 at the Fairfield Fire Hall in Fairfield, PA. The public hearing was open to all and allowed people to ask questions and air concerns about the expansion of mining to Pine Hill, on the banks of Tom's Creek. This permit application by SGI is the last hurdle before they begin mining. 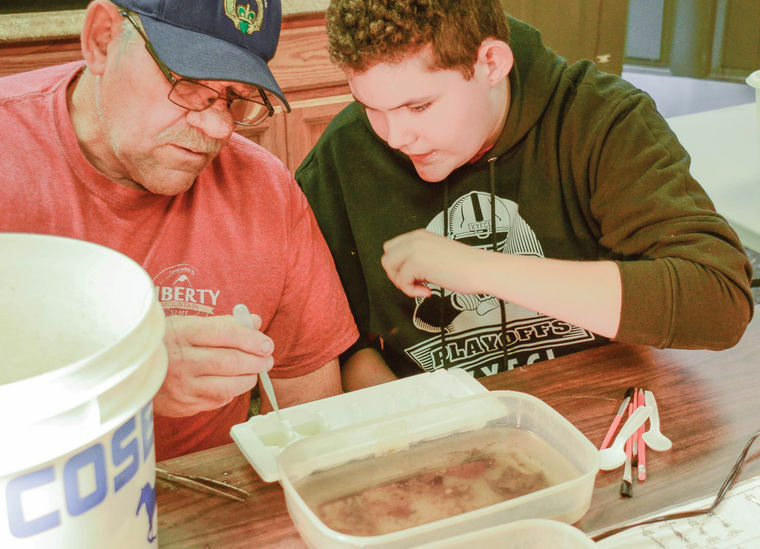 Insect inventory shows Toms Creek still at "High Quality"
One of Adams County's two state-designated High Quality Cold Water Fisheries appears to remain virtually unchanged following a census of bugs - actually, future bugs - conducted by volunteers Thursday evening. "We had one good (scoring area) and two fair," volunteer and Friends of Toms Creek member Wayne Belt said Friday, adding "meaning that the water quality next to Pine Hill was a rating better than 40." He said Pine Hill, on the south side of Toms Creek above Mount Hope Road, is in the vicinity of a mine expansion planned by Specialty Granules Inc. The company mines and crushes basalt rock used for asphalt shingles and tennis court surfaces. In 2011, a group of area residents formed Friends of Toms Creek in an effort to monitor the condition of the waterway, and possibly upgrade the creek from a High Quality to the more stringent Exceptional Value cold water fishery. ​Toms Creek currently is rated High Quality upstream from the covered bridge on Jacks Mountain Road. Lower quality designators include Cold Water Fishery, and Warm Water Fishery - the latter generally applied as a stream enters lower, warmer, regions of its run. Water unsuitable as a fishery would likely be designated "impaired." Aquatic insects - macroinvertebrates means they have no bone skeleton and macro, in this instance, indicates generally visible (though possibly barely) visible to the naked eye - are classified according to how well they withstand polluted water. Higher populations of "sensitive" critters means higher quality water. For Thursday's census, the volunteers stirred up, and scooped with a fine-mesh net, nine square feet of creek bottom in three places: below Pine Hill, near Reeds Bridge, and below where the Tapeworm Railroad once crossed Iron Springs Road. Belt explained that the Pine Hill site scored in the "good" range - the best quality for the type of census performed. The Reeds Bridge and Tapework sites scored "fair" numbers, down slightly from the October 2014 count. About a quarter of Adams County's approximately 1,300 miles of streams are rated "impaired," Adams County Conservation District Watershed Specialist Adam McClain said Thursday. Impairment typically is caused by such factors as residential development and agricultural runoff. Toms and Middle creeks are among several High Quality waterways in the county, which counts only one Exceptional Value (EV) stream - Carbaugh Run, east of Caledonia State Park. Carbaugh Run would be the standard against which other potential EV streams would be measured. McClain said upgrading Toms Creek would require an involved process in which the Department of Environmental Protection would conduct its own census of macroinvertebrate life, as well as measure several other factors according to legislated criteria. Although Thursday's count resulted in slightly lower populations of insects than last October, Patrick Naugle, past president of the Watershed Alliance of Adams County, said there is no immediate cause for alarm. "If we continue to get lower numbers then I would say we've had some deterioration," Naugle said Thursday. Several factors could cause temporary changes in the aquatic population, he said, noting, "That's why you need to have long-term results before you can really say anything definitive." The macroinvertebrate count is performed twice a year. Recently, members of the Watershed Alliance of Adams County (WAAC) joined with members of the Friends of Tom’s Creek to launch a new stream monitoring program in the Tom’s Creek watershed. Even the aquatic ecologists and biologists who participated got excited about the specimens they were finding at the macroinvertebrate count. “There are some rare species here that I have never even seen before!” said Adam Griggs, 20 years an Aquatic Ecologist with the Interstate Commission on the Potomac River Basin (ICPRB). By collecting, looking at stream life in stereoscopes, counting the critters, and learning how to preserve samples, volunteers were provided with a fabulous peek into the life of the waters. Experts typed the “critters” that indicate the health of the stream and its capacity to support fish, especially trout. It is great news that Tom’s Creek has some of the very best indicators for quality water, our water! As Pennsylvania’s executive and legislative branches of government are embroiled in a budget stalemate that lingers well beyond the June 30 deadline, the commonwealth remains significantly behind in its commitment to meeting its obligations for reducing water pollution in the central Pennsylvania counties that are part of the Chesapeake Bay watershed.